I’m delighted to welcome back Antti Kamunen to report again on the exciting activities of the iTask research team, based at Oulu University (Finland). “Multi-tasking” in interaction with other people means synchronising multiple activities between participants, and is, as you can imagine, as complex as it is rewarding to analyse. Antti takes up the story. In the previous post a few months ago, as the iTask project was just beginning, I introduced the team, the initial research questions and the method. Since then, research has shown that interactional multitasking is a pervasive phenomenon; it is everywhere and nowhere! So there is lots more to report, which I think will be of interest to ROLSI blog readers. In this blog post, each of us will briefly present our preliminary findings, by describing some of the observed accomplishments of participants doing interactional multitasking; and outline new perspectives for future research and the project itself. We’ve come a long way, but there is much yet to do. In my doctoral dissertation, intrigued by previous research in mundane and institutional interaction (Egbert, 1996; Lerner, 1996; Heath et al., 2002), I began to explore the possible connections between multi-person situations and multiactivity in the workplace. My data recorded in office organisations showed that colleagues sharing their workspace tend to switch from individual work to collaborative, interactional work in a contingent and emergent fashion. I also showed that situations where some colleagues are involved in a focused encounter in the presence of non-participating colleague(s) was as an understudied area of EM/CA research. In January-April 2016, I collected new video data for the iTask-project in a biochemistry laboratory. With the help of these data, I’ve built up a collection of sequences where an overhearer attempts to join in an on-going interaction. The analyses show that the participants initially involved can set up a multiactivity episode (there are two other possible trajectories) by suspending their interaction, responding to the overhearer, close this interaction and resume the former one without the overhearer. In other words, setting up a multiactivity episode is one method whereby workers can preserve the number and quality of participants involved in an on-going interaction, and thus work through an interactional and professional problem, step by step and in a collaborative fashion. It contributes to regenerating relative rights and obligations at work, in particular collaborators’ entitlement to participate and have a say in the task or activity which is currently under discussion. A common feature to the co-speech gestures described above was that they were overwhelmingly produced in situations with overlapping talk, and that they appear to have a regulating function in halting a co-participant’s on-going turn, usually leading to the non-gesturing participant to (temporarily) drop out and only continue once the gesturer has finished. In the context of a broadcast live interview this phenomenon appears in situations of competition over speakership, whereas in mundane settings the gesture appears to be used also in situations involving multiactivity. My preliminary findings suggest that if the speaker’s simultaneous involvement in another activity (such as preparing tea or eating) leads to a temporary hitch in the progressivity of the on-going conversation, the speaker can produce a blocking gesture – with or without speech – to put the imminent action on hold until they are once again able to continue, or to stop or pre-empt a co-participant from self-selecting during an episode with another on-going activity. Thus, the phenomenon is not necessarily related to achieving multiactivity, but to managing situations in which involvement in multiple activities may cause ‘trouble’ in the organisation and progressivity of turn-taking. I’ve been investigating social action and interaction in mobile settings, in cars in particular (though not the one in the picture, left), for almost ten years. My research led to the observation that drivers and passengers often coordinate their actions between multiple activities (e.g. driving while talking, driving while eating, driving while talking on the phone). It soon became clear that multiactivity is by no means a clearly definable action, but something that emerges from a situation and which is managed in various verbal and embodied means. I’m currently interested in how multiactivity is evident in the use of objects and how passenger drop-offs are socially organised in cars. I dream of one day being able to answer the following question: How many things can participants in interaction do at the same time? Cekaite, A. (2016). Touch as social control: Haptic organization of attention in adult–child interactions. Journal of Pragmatics, 92, 30-42. Nielsen, S. B. (2016). How Doctors Manage Consulting Computer Records While Interacting With Patients. 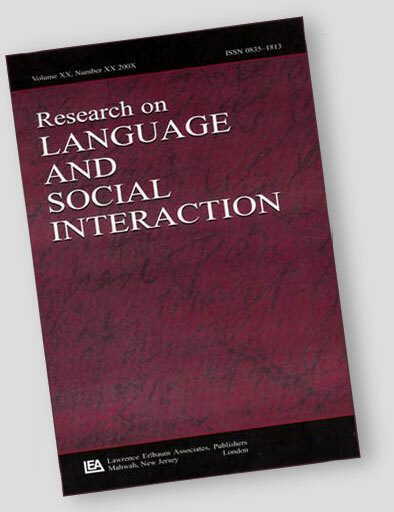 Research on Language and Social Interaction, 49(1), 58-74. Nishizaka, A., & Sunaga, M. (2015). Conversing while massaging: Multidimensional asymmetries of multiple activities in interaction. Research on Language and Social Interaction, 48(2), 200-229.